ww2dbaseAs early as Jul 1941, the Russians knew the Germans were going to breach their defenses and threaten Moscow. On 3 Jul, Lenin's body was moved from Moscow to Tumen to prevent German capture or destruction. Little over two weeks later, on 22 Jul, 127 German bombers raided Moscow, even lightly damaging the Kremlin. As a response, Moscow residents were ordered to build mock houses on Kremlin's grounds and paint the distinct roof of the building in order to blend it in with the rest of the city. Streets were also barricaded in preparation of a German attack. Moscow was proud, however, aided by Joseph Stalin's propaganda machine. One such example was the 7 Nov parade in celebration of the anniversary of the October Revolution, where Russian soldiers marched straight through Red Square toward the battlefields to the west. ww2dbaseAfter a series of attacks and counterattacks from both sides, the German troops were beginning to show signs of fatigue. Replacements came slowly partly due to the unplanned action in the Balkans and Crete, while the brutal Russian winter loomed dangerously near. The Russians, on the other hand, saw relatively fresh reinforcements from the recently arrived Georgi Zhukov and his troops from the Far East; the inability of the Axis powers to negotiate for a joint-attack on Russian had a significant impact on the German ability to quickly bring down Russia, but Adolf Hitler was too egotistical to see. ww2dbaseAfter a few days of preparations in Moscow's suburbs, on 2 Oct 1941, Fedor von Bock led German troops to assault directly against Moscow. German advances were slower than they had hoped with a rainy fall season and later a cold early winter. As German vehicles become immobilized, the German army continued to advance, however the cold weather was affecting the morale and fighting ability of the troops to a high degree. On 15 Nov, another push for Moscow was launched, and within two weeks the Germans reached the 27km marker to Moscow, with some soldiers claiming the sighting of the towers of Kremlin. ww2dbaseThe weather also significantly harmed the German ability to supply the Moscow contingent by rail, despite Minister Dorpmüller and the German Reich Railways dramatically expanding its operations during the campaign. The water tanks of the locomotives regularly froze under sub-zero conditions, pushing the number of broken-down locomotives at any given time to the hundreds. Additionally, the Russian railways were of a different gauge, forcing the German engineers to re-bed all the railways before the German locomotives could use them. In Dec 1941, with the transport situation so desperate that a special motor transport organization was formed to alleviate some of the pressure. Despite the superhuman results the Germans had achieved in the arena of logistics, it was just not enough. The German frontlines troops, including the air force, required the equivalent of 120 train loads of supplies daily for normal operations (ie. not counting supplies needed to mount major operations); only about 100 train loads worth of supplies were delivered on a regular day. To make matters even worse, Russian partisans regularly sabotaged railway tracks to slow things further. ww2dbaseRussians had been launching counteroffensives of various sizes since early Sep to slow the progress of the German army. The counteroffensives were largely planned under the leadership of Zhukov, a man who Stalin feared as a political threat but yet relied on so much to defend his capital. On 5 Dec, Zhukov saw the opportunity to launch a major counteroffensive, while at the same time he knew he could no longer take any chances; the German troops were too close to Moscow for his comfort. He called in his troops of Siberia and the Far East, who had been resting nearby for such a counteroffensive. T-34 tanks and Katyusha rocket launchers led the way for the fresh Russian soldiers, some of whom donned the white winter camouflage that became the subject of nightmares to the freezing retreating German troops. By 7 Jan 1942, the front lines were driven back anywhere between 100km to 250km. German forces would never again threaten Moscow directly for the rest of the war. ww2dbaseThe final tally tilted amazingly harsh on the Russian side of the battle. Russia suffered over 600,000 casualties, with some estimates going as high as 700,000. Meanwhile, the German troops suffered a smaller 250,000 casualties, though the German momentum was stopped while the Russians built up their own. For the efforts of Moscow residents to defend the capital city, Moscow was honored with the title Hero City in 1965.
ww2dbaseSources: In the Service of the Reich, Wikipedia. 21 Jul 1941 195 German Luftwaffe bombers, most of which were He 111 bombers, took off from an airfield near Smolensk, Russia to attack the Soviet capital of Moscow in multiple waves during the night; the resulting air alarms were the first to be sounded in the city. Moscow had strong anti-aircraft defences, the city was protected by 170 fighters, and the citizens were able to take shelter in the newly completed underground railway stations, but German air crews reported the presence of very few Soviet fighters after sunset. On the next day the Soviets would report the downing of 22 German bombers, but German records only showed 6 bombers failing to return. 22 Jul 1941 For the second consecutive night, German bombers attacked Moscow, Russia. Of the 115 bombers dispatched, two failed to returned, one of which was a pathfinder aircraft while the other served in the traditional bomber role. 22 Jul 1941 The German News Bureau in Berlin, Germany reported to the public that the Soviet capital of Moscow had been attacked by German bombers for the first time during the previous night; the aircraft were launched from captured airfields within a few hundred miles from the city. Meanwhile, the German High Command announced that the bombing of Moscow was done in retaliation for Soviet bombings on Bucharest, Romania and Helsinki, Finland. 22 Jul 1941 The Soviet Information Bureau reported that Moscow, Russia experienced its first air raid of the war during the previous night by over 200 German bombers. The report claimed that Soviet nightfighters and anti-aircraft weapons forced the bulk of the Germans to turn back before reaching Moscow; those that broke through the defenses destroyed a number of civilian dwellings, missing key military targets. 17 German aircraft were reportedly shot down. 27 Sep 1941 The Soviet GKO issued the Directive to Organize a Strategic Defense, which proved to be disastrous as it led to over 50 divisions of Soviet troops being trapped at Vyazma and Bryansk in Russia shortly after. 30 Sep 1941 The German Operation Typhoon got an unofficial start when Guderian's Panzergruppe 2 attacked two days ahead of the rest of the operation. 2 Oct 1941 The remainder of the German Armeegruppe Mitte launched Operation Typhoon, the attack on Moscow, Russia. Meanwhile, the German Panzergruppe 2 under General Guderian was split into two pincers at Sevsk, Russia; the northern pincer moved toward Bryansk while the northeastern pincer moved toward Orel. 3 Oct 1941 In Russia, Panzergruppe 2 of the German Armeeguppe Mitte captured Orel 220 miles south-southwest of the Soviet capital in Moscow. Elsewhere, German troops attempted to encircle the Soviet Bryansk Front. 4 Oct 1941 German Panzergruppe 3 and Panzergruppe 4 began to surround rear elements of the Soviet Western Front in Russia, capturing Kirov and Spa-Demensk in the process. The German troops continued to advance toward Vyasma to complete the envelopment. 5 Oct 1941 The leading German formations reported that they were only about 100 kilometers from Moscow, Russia. On the same day, Moscow-based Soviet fighters discovered German vehicles as close as 50 kilometers from Moscow; when Moscow Military District's Air Force Fighter Command chief Nikolai Sbytov reported this to his supeiors, he was investigated by the NKVD for disseminating false rumors, but he was lucky that Joseph Stalin believed him. For precaution, Stalin ordered the Soviet Western Front to withdraw to Vyazma to form a new defensive line under a new commanding officer, Georgy Zhukov, replacing Ivan Konev. 6 Oct 1941 Eight Soviet Armies were encircled at Bryansk and Vyazma, Russia by a surprise maneuver conducted by German 17th Panzer Division. In less than two weeks, the Germans have taken nearly 700,000 prisoners and destroyed or captured 1,200 tanks and 5,000 heavy guns. 7 Oct 1941 German 10th Panzer Division captured Vyasma, Russia at 1030 hours, surrounding 5 Soviet Armies. Georgy Zhukov, who had been recalled from Leningrad, Russia and sent to report on the situation on the West Front, arrived at Ivan Konev's headquarters to discover that there was no information concerning the Vyasma encirclement. He was forced to report to Joseph Stalin that there was no longer a continuous front in the west, and the large gaps could not be closed because the command had run out of reserves. 10 Oct 1941 The Soviet 32nd Rifle Division began to arrive at Mozhaysk, west of the Soviet capital of Moscow in Russia, from Siberia. Further west in Gzhatsk in Smolensk Oblast, 40 miles west of Mozhaysk and 32 miles east of Vyasma, Soviet 18th and 19th Tank Brigades halted a German offensive. German 4th Panzer Division reached Mtsensk, Russia in Oryol Oblast, but it would be held there for many days by stubborn Soviet resistance. 11 Oct 1941 Thousands fled Moscow, Russia based on rumors of an imminent German capture of the Soviet capital. To the west, the enveloped Soviet troops at Vyasma suffered a heavy artillery and air bombardment that caused heavy casualties. 12 Oct 1941 German troops captured Bryansk and Kaluga in Russia. 13 Oct 1941 German troops captured Kalinin (now Tver) and Rzhev northwest of Moscow, Russia; the Soviet 30th Army was encircled and wiped out at Rzhev. West of the Soviet capital, Soviet 18th and 19th Tank Brigades fell back from Gzhatsk (now Gagarin) toward Mozhaysk 30 kilometers closer to Moscow where the new main defensive line was being constructed. 14 Oct 1941 The Soviet troops in the Bryansk pocket in Russia were eliminated (50,000 captured), while the Vyazma pocket was within days of the same fate. In Berlin, Germany, Adolf Hitler ordered that the Soviet capital of Moscow was to be enveloped, not attacked directly. Meanwhile, in Moscow, Joseph Stalin briefed 23 senior Soviet military and civilian officials between 1530 and 1815 hours on a plan to evacuate the city in an orderly fashion; he ordered four theater groups (Lenin State Theater, Maxim Gorkiy Artistic Academic Theater, Little Academic Theater, and Vakhtangov Theater) to be evacuated first. 15 Oct 1941 In Russia, German 1st Panzer Division turned northwest, thus away from Moscow, to attack Soviet Northwestern Front from the rear. The Soviet GKO ordered the NKVD, various agencies, and various foreign legations to evacuate from Moscow to Kuibyshev (now Samara). 16 Oct 1941 Tanks of SS Reich Division and 10th Panzer Division attacked the Mozhaysk Line at Borodino, Russia 125 kilometers west of the Soviet capital of Moscow; lacking infantry support, Soviet troops halted the attacks. While thousands of civilians continued to flee the city, the Soviet government and diplomatic corps moved to Kuibyshev 1,500 miles to the east; Joseph Stalin, however, chose to stay. 17 Oct 1941 German SS Reich and 10th Panzer Divisions made slow advances along the Moscow Highway and Minsk Highway toward the Soviet capital of Moscow, Russia. The Soviet 5th Army slowly fell back toward Mozhaysk, Russia. 18 Oct 1941 German SS Reich and 10th Panzer Divisions captured Mozhaysk, Russia. In the evening, a motorcycle battalion of SS Reich Division found the Minsk Highway toward Moscow, Russia, 90 kilometers to the east, undefended. 19 Oct 1941 German troops defeated the Soviet forces within the Vyazma pocket in Russia and captured 670,000 men, 1,000 tanks, and 4,000 artillery pieces. At Volokolamsk, the northwest end of the Mozhaysk defensive line, newly arrived Soviet 316th Rifle Division halted the attack by German 4th Panzer Army. In Moscow, Lavrentiy Beria advised the Soviet GKO to evacuate the capital "or they will strangle us like chickens", but it was rejected by Joseph Stalin; however, Stalin did order the Politburo (less Stalin, Beria, and Georgy Malenkov) to evacuate. 22 Oct 1941 German Panzergruppe 2, resupplied with fuel and ammunition, continued the northeastward advance on Moscow, Russia. German 4th Panzer Division resumed the attack on Mtsensk, Russia. 29 Oct 1941 Kampfgruppe Eberbach of German 4th Panzer Division reached Tula, Russia, which was about 110 kilometers south of Moscow. The group dug in near Tula to organize an offensive in the next day. 7 Nov 1941 Joseph Stalin made a speech during the October Revolution anniversary celebration predicting that even though German troops were less than 100 miles from Moscow, they were facing disaster. Meanwhile, in Berlin, the German Army High Command (OKH) was determined to continue the advance on Moscow in spite of up to 80 Soviet Army divisions in front of them. 15 Nov 1941 German Panzergruppen 1, 2, and 3, with 2, 4, and 9.Armeen, resumed the attack on Moscow, Russia. Soviet 30th Army was pushed back from the Volga Reservoir and Moscow Sea Reservoir areas 75 miles north of Moscow. Across the Eastern Front, the temperature fell to -20 degrees Celsius, freezing both men and machines; the German offensive was generally slowed to a yard-by-yard advance from this date on. Great Job! I can see that it must take a long time to write all the infromation on this website, but it would be perfect if only it had a little more infromation on each event. Ha! Attacking Russia was the worst mistake Hitler made. General rule: You never attack Russia, because they retreat, blowing up oil refineries and leaving no supplies, nothing. They get you deep into the country. Then winter comes. Theyre used to it. They drink vodka and laugh at you as you freeze. Then they counterattack and you go back to where you came from. Hitler didnt think this through. Good for Russia! The invasion of Russia was the begining of the end for Nazi Germany. the russians had vast manpower, moved all the factories past the ural mountains, and had the help of the bitter russian winter! on top of all of this the russians put the T-34 Tank into the field. one German General said it was the best tank in the world. not bad for the sub-humans. the german's answered with the Panther, and it was over-enginered. just keep it simple. The T-34 this vehicle is still used in armies to this day. not bad for a design over 60 years old. The T-34 led the way, in future tank design. During ww2 the german's built around 1,500 Tiger's the russians built over 50,000 T-34's.not counting all other armored vehicles. The T-34 is a good example of the old saying "guantity, has a quality all it's own". "Moscow will be defended to the last." -Joseph Stalin, Order of the day, Oct. 1941- During the battle for Moscow from Oct. 1941 to Jan. 1942, 650,000 Russian soldiers died this figure is about 50% of the men fighting on the Eastern Front. The Soviet attacks, forced the Germans to retreat 175 miles from Moscow, the city was saved and Hitler did not try to take the city again. With almost one million casualties, Germany would never be as strong as it had been in 1941. The Axis suffered over 918,000 casualties in Russia in 1941 alone almost 1/3 of its fighting strength. Despite suffering heavy losses the German Army, was able to rebuild its forces for new operations on the Eastern Front in 1942. I will never understand why historians always make Stalingrad out to be the most decisive turning point of the war on the Eastern Front. If Moscow had fallen in the winter of 1941/42, there would have been no Battle of Stalingrad and not much left of the Soviet Union. Hitler's greatest mistake, or should we say failure,was he lost the war. In a war on such colossal scale to have luck is important. Such luck would include being able to make correct decisions at the right time.Luck deserted him in the closing stages of the war. This was a war of attrition between the Germans and Russians. And Europe suffered and bled profusely and whole of eastern Europe came under Bolshevic subjugation and tyranny for almost 50 years as Hitler had rightly predicted. And all this while America and Britain did not really suffer much. well i have questions I'm doing a 5 page essay for my English class and I'm required to compare the Vietnam war with any other and Ive chosen this..so how exactly would someone compare a war like this to the Vietnam war? so youre saying that russia fighting the nazis at the gates of moscow was a muslim jihad? i dont think so, russia at that time was so huge a land area comprising like 15 nationalities,the muslims were just one of them and the ss had a volunteer muslim division fighting against russia as well so what exactly is your point? no matter what germany or japan or russia or china did, in the end ,the usa would have won, because, we had the atomic bomb first. and in 1946 and 1947 and 1948 we should have taken over all the oil countries,we easily could have ,without a shot being fired,just signatures on documents, because, we had the bomb, then all this kissing the terrorists asses for the last sixty five years would have been avoided,we would be calling the shots ,so why! didnt! we! The "Battle of Moscow", was an overrated Soviet victory. The German casualties were much lower than most historians say they were. In fact total German deaths in Dec. 1941 was only just under 15,000. And total missing for the entire 1941 campaign was only less than 29,000. People always use Soviet data, but it is false. Only the meticulous German data can be used. So Soviet deaths and wounds cases will never be known. Does anyone have the picture of the Kremlin taken thru Von Bock's field glasses early December 1941 - they could email me please. Hard to find. Thanks. if the german generals had their way,without hitlers paranoid interference,the nazis would have taken moscow by early october at least.before the snow and below zero hell hit the eastern front.the nazis had already penetrated half of the way to moscow in only six to eight weeks! then...hitler split the main thrust! and it was all down hill from there.what the hell was he thinking! and who's side was he really on? What is the first thing you do when a bear attacks your wife? Get the bear out of your kitchen. No mercy to the KRAUTS! Is this all made up words panzergruppe 1? My great grandfather died during the battle of Moscow. He was in one of the ski battalions who reinforced the city. the war in Africa and western Europe (fought by the Americans and British Commonwealth) were not proportionally significant in the final defeat of Germany. 80% of the manpower and economic production of Germany was devoted to the eastern front. The Germans lost more than 750,000 soldiers in the first 6 months of the Russian campaign. Although the Russians lost many more, they had space, multiple times the population of Germany and were fighting on 1 front. If you look close at Stalin, and Hitler they were pea's in a pod. Stalin killed most of the Russian Generals between 1929 to 1930's. He trusted no one. When Hitler was planing his Soviet invasion he wanted to end it by 6 months. When Stalin was informed by military of the German War coming to Russia, he refused the information. Many military staff were killed. When the war did start, why did Russia's armed forces do nothing?? Poor leadership is as bad as Hitlers agenda. Urban war fair, and poorly equiped soliders defending Russia they still managed to hold back the German forces. It was the will of Russian people to either die or die defending that pushed the scale in favor for Russia. 20 to 25 million people died in this war. May this be a lesson in histroy never to be repeated. What a war...I think hitler failed to take over Moscow simply because the soviets decided to defend the city at all cost. 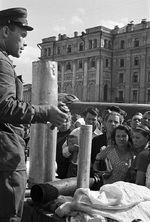 The unity and decision of the ordinary citizen brought great victory to the soviet union. Great work! It's clear that the germans never had a chance even if Stalin didn't bring back Zhukov and Moscow was lost. Bad luck you say? What would you expect from mentally ill degenerates both Hitler and Stalin? The germans would be nowhere near Moscow in 1941 if the russians had a competent leader. Meticulous german planning you say? What happened to the supply lines, lack of paved roads, cold weather etc.? Communism you say? What about nazziizm and the german superiority crap? The history lesson here is the only way to go is Democracy. A nation will pay dearly for obeying a dictator. good job russains i believe the russains paid dearly the ultimate sacrifice,amonst allof the allies they knew this was it, losing was not a option and it seriously took blood and guts to stop the"invinciple" german warmachine. The early and extremely cold winters plus its huge geographical size were always Russia's best defense. The Russians even abandoned Moscow and let French troop under Napoleon Bonaparte conquer it, but those invaders were ultimately also defeated.